"I feel bad about what I did to Kikuo. But I know he will forgive me someday. He'll understand. Because we've been buddies since we were kids together." What characteristics does one typically associate with youth? Potential? Energy? Excess? Rage? Irrationality? We were all young at one point in time (some of us still are). We have all experienced these things firsthand. The work of director Kinji Fukasaku has frequently explored the desires and detriments of youth. He is most well known for his many skilled yakuza films, or crime dramas, set during Japan�s postwar economic boom. In the recent, controversial Battle Royale (2000), Fukasaku returns to the themes he found intriguing thirty years prior. In If You Were Young: Rage Fukasaku investigates all of the aforementioned elements, creating an engaging, non-linear melodrama. The term "rage" in the title refers little to anger, but more to the pure energy and ambition rampant in youth. The film is also political, depicting the socioeconomic struggles faced by youngsters who wish to maintain autonomy among an increasingly commercialized and unified system. The plot is quite simple, yet holds potential for great character drama. Asao (Gin Maeda) and Kikuo (Tetsuo Ishidate), best friends from early childhood, have come to Tokyo to find work and build a future. These "golden eggs" encounter hardship, years of mindless work and eventually, unemployment. In the midst of this desperation, they form a posse of sorts: Three companions join the pair, creating a rambunctious, energetic five. After landing in jail, they make a pact: They will buy a dump truck go into business for themselves. Okay, let's be honest—buying a dump truck is not the loftiest of endeavors, but at least they have something to strive for. Once the shiny green Isuzu truck, dubbed "Independence No. 1" is acquired and christened, life is good. However, misfortune is not through with these youngsters. While potential for the future is still there, in the film�s climax, crime makes a bitter return, and decisions must be made that will affect the deep friendships that are the backbone of the protagonists' frustrating lives. What makes this film so engaging is it's overwhelming energy. This kinetic, enraged quality, created by skilled acting and unique visuals, effectively captures the characters' youthful spirits. Gin Maeda and Tetsuo Ishidate (Asao and Kikuo, respectively) give intense performances. It is easy to believe that these two have been close friends for most of their life. Gin Maeda has a distinct Toshiro Mifune quality. Their fellow group members and girlfriends efficiently portray the ambitions and failings of youth, and these performances are a pleasure to watch. As a quote from the Chicago Reader on the back cover states, "Viewing the film is a bit like being bounced around inside a cage." This is a good summary of the visuals. Fukasaku's intense style is quite stunning, utilizing the 2.35:1 scope image to its fullest. The camerawork is frequently handheld, and zoom lenses are used a bit too often. Colors are appropriately bold and flashbacks are shown in a distinctive, color-tinted monochrome. Editing is also quite unorthodox and becomes gimmicky at times. Told in a non-linear fashion, story elements and character details emerge bit by bit, like pieces of a puzzle. Still images are used throughout, as seems sometimes in Hawaii 5-0. Fukasaku sometimes chooses to showcase dichotomy by strobing back and forth between two shots. These effects, while being occasionally disorienting, serve the film well. This is my first experience with the director�s work. Being a fan of Japanese film in general, I was happy to explore a new director. While this film does not approach the mastery of Kurosawa, it is worthwhile. 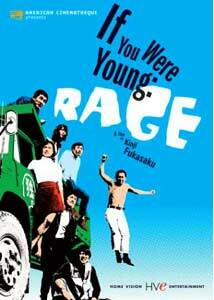 If You Were Young: Rage is Fukasaku's long lost gem, and uniquely captures a group of youngsters who strive to maintain a sense of independence. Despite their setbacks, hope for the future and a chance to start over is always just around the corner. Note: This work was thought to be lost until a print was discovered only a few years ago. Image Transfer Review: HVE has provided a quality image that captures the bright colors and interesting compositions of Fukasaku's 'scope photography. The anamorphic 2.35:1 transfer is very clean, and exhibits a good level of detail, considering the film�s age. The brightly lit, colorful day scenes and the monochromatic, color-tinted flashbacks are well preserved. However, the image is frequently soft, and the colors become washed out in certain scenes. Grain is sometimes present (especially in dimly lit scenes), and the occasional print damage appears. These defects do not detract from the presentation. They contribute to a rather film-like image that is free of edge enhancement. Considering that this print was lost until the late 1990s, it is in remarkable shape. Overall, a solid transfer. Audio Transfer Review: The Dolby 2.0 track included is really a mono track spread across the front left and right channels. Dialogue is clear and clean and the somewhat repetitive music track shines through nicely. Occasionally, some sound effects and/or music sound quite tinny when they enter the higher frequencies. Considering the dated source, it gets the job done. Extras Review: Extras are rather sparse. HVE has provided an interview with Kinji Fukasaku (08m:34s). The director discusses his inspirations for If You Were Young: Rage, and how the messages of the film differ from one of his most recent work, Battle Royale. He even discusses his desire to address the ills of terrorism in an upcoming project. This is an interesting piece, peppered with publicity stills and clips from the film. The only other extra on the disc is a director's filmography. I would liked to have seen a commentary from a Japanese film scholar that could have provided a bit more context for the film's events. I can't imagine much extra material can be garnered for this somewhat obscure film. Kinji Fukasaku's intense film is a stylized look at the energy, passion, rage, and failings of youth trapped in an increasingly difficult economic situation. Somewhat political yet largely melodramatic, there is more that meets the eye in this energetic work. HVE's presentation is very good, yet light on the extras (no dump truck included). Still, it's worth at least a rental. Recommended.